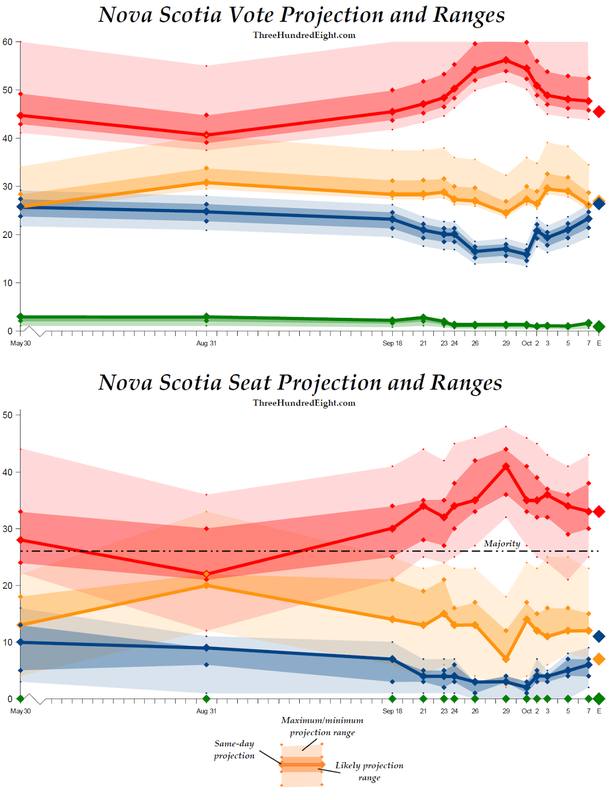 The following are ThreeHundredEight.com's final forecasts for the upcoming provincial election in Nova Scotia, scheduled for October 8, 2013. 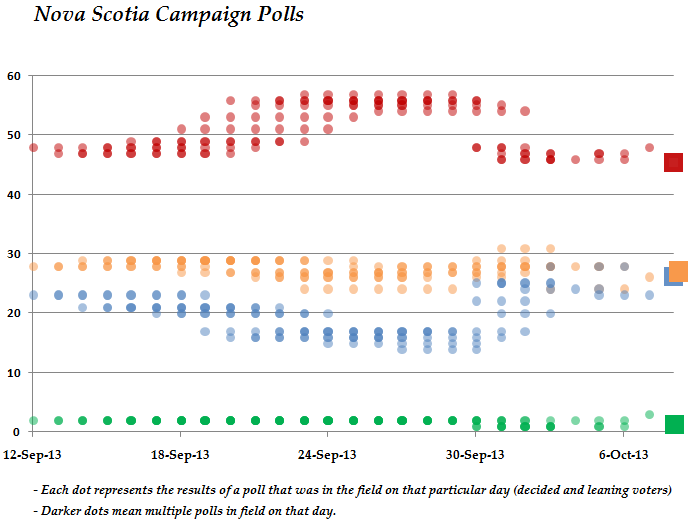 These numbers were last updated on October 7, 2013, and reflect the best estimates as of October 7, 2013, the last day of polls included in the model. You can click on all of the charts below to magnify them. 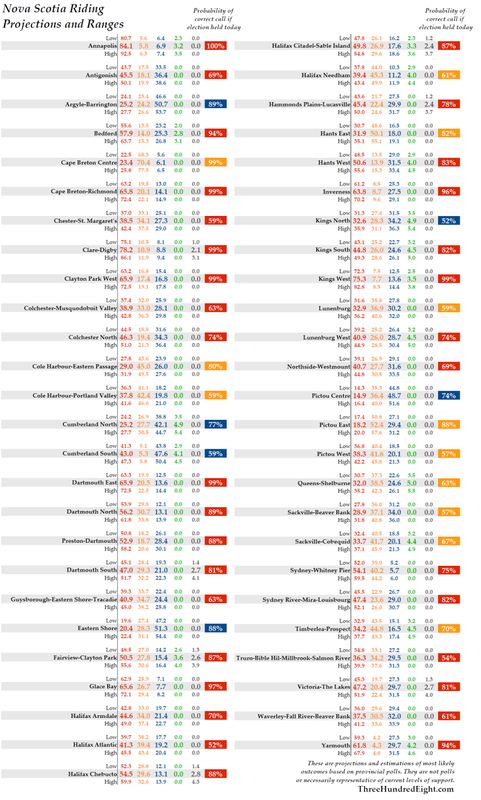 The vote and seat projections in the central columns reflect the best estimates based on the available polling data. The low and high projections are based on the likely over-estimation or under-estimation of support the polls are likely to make, while the minimum and maximum projections are based on the highest degree of error polls have made in recent elections for parties in a similar position (i.e., British Columbia and Alberta). The projections highlighted within the boxes signify the range of most likely outcomes, based on the degree of polling error made in past elections for parties in a similar position. The chart below shows how each party is classified, and the probability that the result will fall within any of the projection ranges. Based on these probabilities, there is a 68% chance that the outcome of the election for the New Democrats will fall between the best estimate (or average) projection and the high projection. There is an 84% chance that it will fall between the average and maximum projection, and so on. It is, of course, possible that the outcome will fall outside of even the maximum and minimum projected ranges and a new historical precedent for error would be set. The following is a list of the current projections for all 51 of Nova Scotia's ridings. These are the best estimates of likely outcomes if an election were held on the last day of polling. 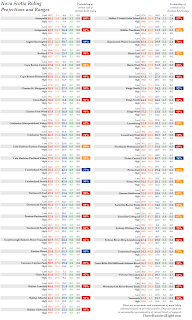 The high and low results are the estimates of likely floors and ceilings, based on the high and low vote projection ranges. The probabilities listed beside each riding is the likelihood that, if an election were held on the last day of polling, the winning party identified by the model would actually win. It does not assign any probability to a particular trailing party winning the riding - if a projection gives the leading party a 75% chance of winning, there is a 25% chance that any of the other parties could win (though, in practice, most ridings are only contests between two parties). 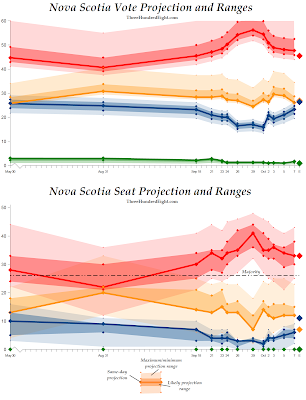 The chart below shows the evolution of the Nova Scotia projection. The shaded bars show the likely and maximum/minimum ranges as well. The chart below shows the polls released during the campaign, with each dot representing a result of a poll in the field on each day.